As April 4th, the fourth anniversary of Roger's death approaches, we are planning several things to commemorate his life and work, including a meet-up at his star on the Hollywood Walk of Fame; Ebertfest, his film festival started at the University of Illinois 19 years ago; a special online introduction of a sample of his archives by the University of Illinois; a gathering of the Ebert Fellows from around the country, and celebrating the release of his newly published The Great Movies IV. But one of the things that delights me is that film societies are still showing the documentary, "Life Itself." It was a film that was almost not made. If we hadn't started when we did, we would have never done it. About half-way into the movie, we discovered that his cancer had returned. Sometimes ignorance is bliss. Because we didn't know it was near his end, he bravely went forward and now we have the gift of seeing him on the screen, in all his magnificence, both human and transcendent. ("The Departed," "Raging Bull") and Steven Zaillian ("Schindler’s List," "Moneyball") present "Life Itself," a documentary film that recounts the inspiring and entertaining life of world-renowned film critic and social commentator Roger Ebert – a story that is by turns personal, wistful, funny, painful, and transcendent. 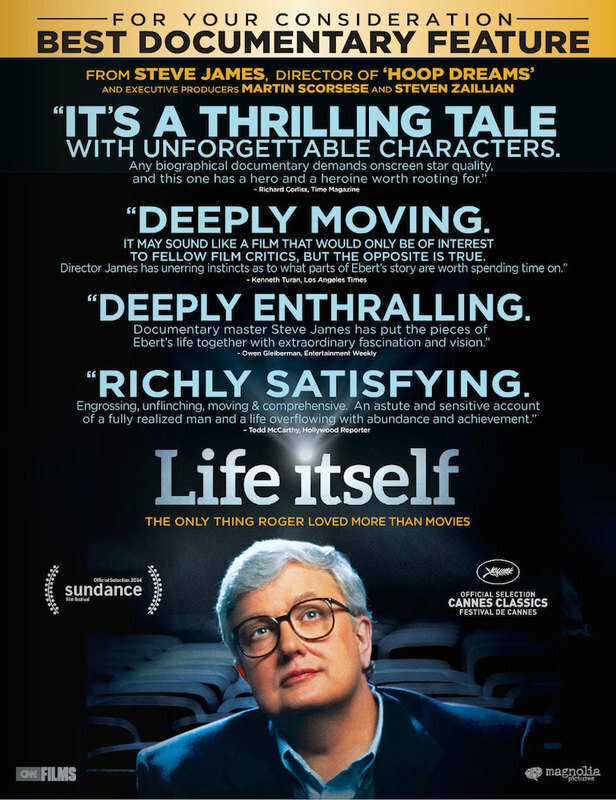 Based on his bestselling memoir of the same name, "Life Itself" explores the impact and legacy of Roger Ebert’s life, from his Pulitzer Prize-winning film criticism at the Chicago Sun-Times to becoming one of the most influential cultural voices in America. [...] Filmmakers and politicians reflected on Roger’s legacy – everyone from Spike Lee, and Michael Moore to President Obama, who said, “When he didn’t like a film, he was honest; when he did, he was effusive – capturing the unique power of the movies to take us some place magical.” [...] Despite his "leave of presence," his body of work stands as a great populist monument, accessible inspiration for the next generations of film lovers. "Life Itself" made the Oscar shortlist in 2015, and was named Best Documentary by the Producer's Guild of America and the National Board of Review. Among other awards it earned were the Founders Prize at the Traverse City Film Festival, a Jury Prize at the Documentary Edge Festival in New Zealand, the Best Documentary prize at the 5th American Film Festival in Wrocław, Poland and Best Equality of the Sexes at the Women Film Critics Circle Awards. Tickets for "Life Itself" are $5 for the general public and $3 for members (plus applicable handling fees). They can be purchased at the box office Tuesday to Saturday from 10 a.m. to 4 p.m., by phone 250-338-2430, or online at sidwilliamstheatre.com.